Vivacity. Liveliness. Enthusiasm. Spirit. Rare talent. That’s what VERVE means. That’s what Vervely wishes to bring to its clients and programs. We want to offer our services in Digital Media and Community Engagement with as much zeal, sparkle, and gusto… Vervely! Planning and Strategy – Whether you need to create realistic strategic documents for your content, community engagement, social media, and/or your overall communications, we have a variety of approaches to help you to develop action and goals-oriented strategies for your organisation and/or your personal/professional brand. Content and Social Media Management – From content calendars to social media policies, as well as overall content and community management, we’re here to help with initial planning and templates, or ongoing consulting. Content and Social Media Audit – If you need someone to take a good look at your online properties and assess your needs, gaps, and success points, talk to us. Online Branding and Personality – Get to know your organisation’s voice and find ways to express yourself in your own unique way through your various communications channels. If you’re not sure how to refine that voice, or if you just need help to find your groove, then we’ll be more than pleased to coach you in the process. Measurement and Analysis – Wherever you might be in the Growth Phases of content and social media, we can develop appropriate metrics and find the real story behind the data for you and your organisation. Training, Coaching, and Mentorship – We offer customised workshops, standard speaking events, webinars, online learning, and one-to-one coaching and mentorship in our areas of expertise. Let us know what you need and we’ll find a solution that would best fit you. Vervely was founded by Shai Coggins in May 2012. This is following over a decade of experience in print, online content, web communities, and social media. Shai has worked with various not-for-profit organisations, start-ups, small businesses, and companies in Australia and in different parts of the world. She was a co-founder and Community VP for b5media, a Canada/US-based company that received over $10M of VC funding. Shai has presented in various conferences, workshops, webinars, and events around Australia, the USA, and the Asian region, including Microsoft NGO Connection Days in the Sydney, Kuala Lumpur, Colombo, Manila, Cebu, Davao, and Bacolod. 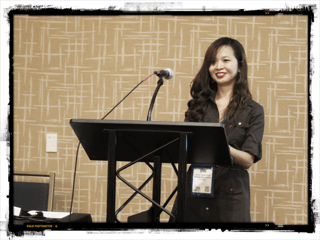 She also presented at two Nonprofit Technology Conferences (’11 in Washington DC and ’12 in San Francisco, CA). She was one of the committee members in two Connecting Up conferences, wherein she keynoted in 2011. In the recent Connecting Up 2012 Conference, Shai was voted as one of the Top 4 presenters and received over 90% approval rating from attendees. Shai has also received a number of accolades for her work, including “Most Influential Women in Technology” by Fast Company (2009), and other Top lists in social media and blogging. Shai’s work has also been featured in different media and publications such as The Advertiser (Adelaide), Reader’s Digest (Australia), Manila Bulletin (Philippines), Elle Magazine (Singapore), SBS Radio Australia, and ABS-CBN TV. Shai wishes to bring all her experience and passion in to providing great content and community engagement solutions for you and/or your organisation. You can read more about Shai and other recommendations of her work at: Shai Coggins’ LinkedIn Profile.